Is it time to upgrade those old sheets you’ve had for ages? Well it may be time to take a look at the new Nile Threads sheet set. 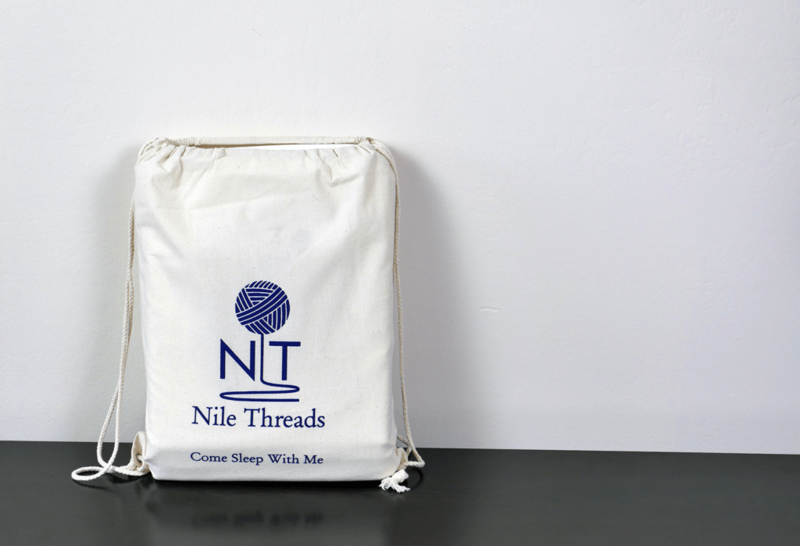 Nile Threads is a company devoted to making a difference for both sleepers and the less fortunate around the world. 10% of their profits are donated to the United Nations High Commissioner for Refugees. But do these sheets really perform at a luxury level? Continue reading below for my full review of the Nile Threads sheet set. In a time crunch? Click here to slide down to my review summary. Take $15 off your order! Made with 100% Egyptian cotton, the Nile Threads sheets are as soft as they are comfortable. Enjoy $15 off your order with code SLEEPOPOLIS! The Nile Threads sheet set is constructed from 100% Egyptian long staple cotton. Each individual sheet set comes with a fitted sheet, a flat sheet, and 2 pillow cases. Compared to most sheet sets, this is a nice feature. Typically, you have to order size full and above to receive two pillow cases. Additionally, these sheets have a 600 thread count. The pillow cases have a unique encasement structure that prevents the pillow from slipping out of its case during sleep. This feature also helps to avoid a messy look with any extra fabric around the pillows. The fitted sheet was easy to place around the mattress and fits tightly around the entirety of the mattress. Finally, the flat sheet was plenty big enough for a king size mattress. Both the fitted and flat sheet are large enough to accommodate thicker mattresses. I tested on a 10″ mattress, but I estimate that it would be fine for mattresses up to 16″. All in all, the build quality of the Nile Threads sheet set is quite good. I came to this conclusion by examining every inch of the stitching, materials used, and overall construction. After careful examination of the stitching, I was only able to find a few very small loose threads. These threads do not look as if they will cause any major problems in the long term. The pillow cases did not have any noticeable loose threads or issues with the stitching in general. The design of these pillow cases ensure a nice, tight fit around the pillow in addition to a high level of breathability. When testing the Nile Threads sheet set, I took a few major factors into account. To kick things off, shrinkage. 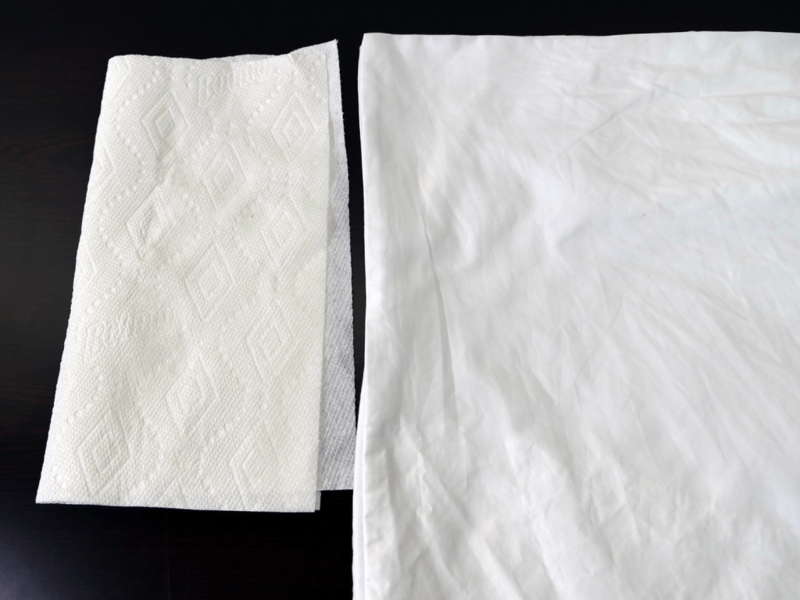 The most common issue with sheets tends to be shrinkage. We all want to know that if we order a King size sheet set, we’re still going to own a King size set after a normal wash / dry cycle. Next up, thread examination. Are there any problematic loose threads? Did any preexisting threads get worse after a wash / dry cycle? Lastly, I test the colors used in the sheets to determine if there is any sort of deterioration. Shrinkage is probably the most important aspect when testing new sheets. Prior to washing and drying the sheets, I take measurements that serve as my baseline. After doing so, I put the sheets through a standard wash / dry cycle. Once the wash / dry cycle had completed, I took new measurements to compare against the baseline measurements. All in all, I saw very little shrinkage. 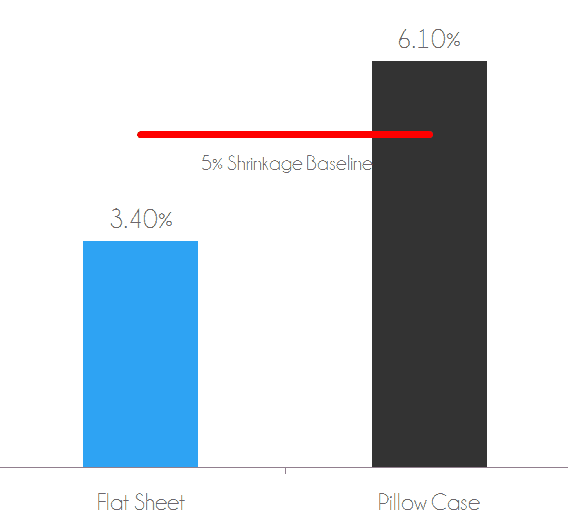 The flat sheet shrank 3.4%, compared to its original size, and the pillow case shrank 6.1%. The shrinkage on the flat sheet was extremely good, well within normal limits. However, I was a little surprised to see the pillow case shrink by 6.1%. It’s just a little over what would be considered normal, but surprising given how little shrinkage the flat sheet showed. Typically shrinkage is most drastic after the first wash / dry cycle. Therefore, I would not expect to see much more shrinkage, if any, from here on. 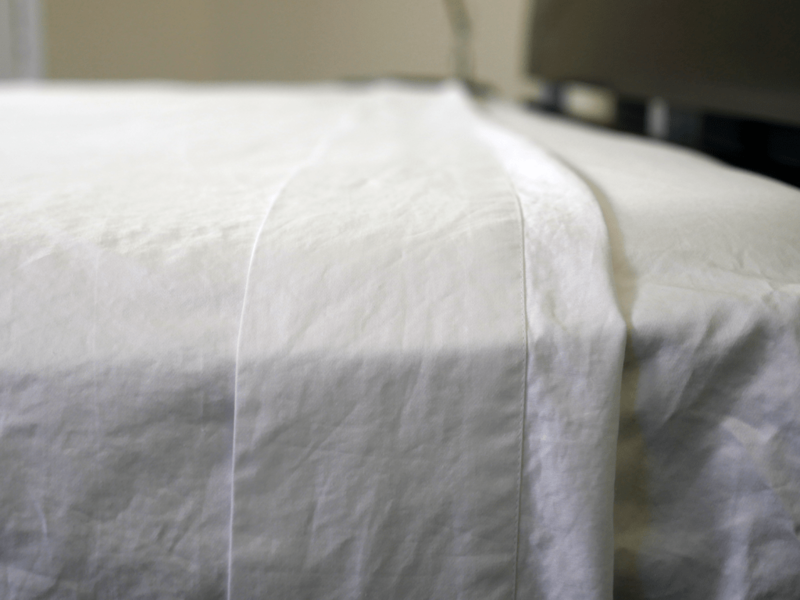 Shrinkage test – flat sheet shrank 3.4% after wash / dry. Pillow case shrank 6.1% after wash / dry. This test requires closer analysis of the overall quality of the sheets after normal use and several wash / dry cycles. After further review of the Nile Threads sheets, I did not notice any additional damages to the sheet. 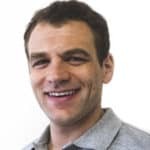 In addition to that, the existing threads did not get any worse and did not appear to have any affect on the quality of the sheets. Overall, the Nile Threads sheets seems well very built and quite durable. To test the colors of these sheets, I completely soaked a pillow case in hot water and allowed the case to fully absorb the water. Following this, I gently rung out any excess water with my hands. Next, I placed the pillow case on top of a bed of paper towels and used a rolling pin to firmly press the case against the paper towels. Lower grade (sheets) colors will run off onto the paper towels. With the Nile Threads sheet set, that was not the case. There was absolutely no color run off. The Nile Threads sheet set has a nice, soft feel in my opinion. The specific cotton used here seems to make a significance difference, as there is a noticeable difference in the level of softness and overall feel vs. other 100% cotton sheets I’ve tested. Probably my favorite attribute about these sheets is their ability to rest on me without sticking to my body. As I go on in my reviews I find this to be more and more important. No one wants to be sleeping comfortably and then all of the sudden, you’re sheet-less because your partner rolled over and the sheets went right along with them. With that said, I would say these sheets fall around a 3 out of 10 on the softness scale, with 1 being the softest. With the soft feel of these sheets comes a smooth texture. Their sateen weave and traditional four over one under pattern combine for some of the smoothest sheets I have tested to date. The Nile Threads weave structure also helps a ton with breathability and cooling. The sheets do not heat up like most traditional cotton sheet sets. The long staple Egyptian cotton does a great job of keeping your body cool and allowing the mattress to breathe as well. Interestingly enough, the sheets are actually slightly thicker than most sets I have tested. Yet, they are able to compete with some of the coolest sheets on the market. In terms of style, these sheets are fairly basic. They are all white and have very little in terms of aesthetic design. As a cotton sheet they are also more apt to wrinkle vs. polyester or other blended fabrics. Nile Threads recommends not ironing these sheets, so if a super sharp pressed look is critically important that is something you’ll want to seriously consider. Who Should buy the Nile Threads sheet set? Want 100% Egyptian long staple cotton sheets – made from 100% Egyptian long staple cotton, these sheets are very nice. They have a smooth, sateen weave, a lightweight texture, and a welcoming feel about them. Want to make an impact worldwide – 10% of the profits Nile Threads make are donated to the United Nations High Commissioner for Refugees. If you want to know that your purchase is making a difference in someone’s life, these sheets are a great option. Want to sleep cooler – from the lightweight texture to the high breathability, these sheets sleep quite cool. I would say they rank among the best cotton sheet sets I’ve tested to date. Needless to say, they avoid traditional heat buildup and allow for a much cooler sleeping surface. Wanting a little more information on the Nile Threads or ready to buy? 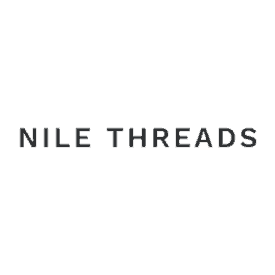 Visit NileThreads.co. Don’t forget to use code SLEEPOPOLIS to save $15 off any Nile Threads order. Built from 100% Egyptian cotton, the Nile Threads sheets are soft, sturdy, dependable, and cool. If you’re a fan of the classic yet sleek white sheets, this set is a great option. The sateen weave is gives the sheets a smooth feel in addition to their lightweight structure. Most importantly, Nile Threads donates 10% of their profits to the United Nations High Commissioner for Refugees. So not only will you be sleeping better with these sheets, you will also be making a difference in another individuals life.